Normally it'd take a telescope the size of a planet to do so. Never before have we captured the immense scope of a Black Hole in a photograph. Photographs of space edited with added painted black circles to represent these collapsed stars have been our sole visual tool. But, thanks to recent advancements in modern technology, we will soon be able to successfully photograph a black hole — or rather, the shadow of one. The black hole we will be visualizing — called Sagittarius A — serves as the center of our milky way galaxy, 25,000 lightyears away from Earth. It is estimated to be 4 million times the mass of the Sun and is growing larger all the time by pulling in matter. Tom Muxlow, astronomer at Manchester University, described in an interview with the Guardian how we will take a picture of this gargantuan, interstellar beast. 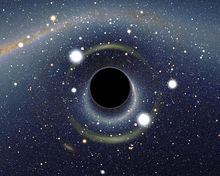 And, believe it or not, these scientists suggest that the images of the black hole will likely closely resemble the artistic representation in the movie Interstellar. Christopher Nolan, director of the film, worked with astrophysicist Kip Thorne to ensure that it was a realistic depiction. For example, the film team included glowing strands that were being sucked into the black hole. In real-life physics, those strands make up what is called an accretion disc. And, while the movie portrayal wasn’t exact, it at least gave the public a general frame of reference. To accomplish this monumental task of capturing Saggitarius A on camera, scientists had to first create a telescope that was equipped for the challenge. Because a black hole’s gravitational pull is so intense that even light gets sucked in, photographing one isn’t such a simple task. To correct for this, the specially designed Event Horizon Telescope will use natural surroundings to silhouette the black hole. This indirect photograph will give scientists invaluable information that could help them more fully understand how our galaxy formed, and it could also teach us more about relativity. Whatever we learn from this new development, it’s sure to be an incredible sight.